This set of Basic Civil Engineering Questions and Answers for Freshers focuses on “Various Cycles of Environment”. 1. The carbon cycle has how many parts? Explanation: The carbon cycle naturally has 2 parts, the terrestrial (movement of carbon through terrestrial ecosystems) and the aquatic (which is related to carbon movements through marine ecosystems). 2. The carbon cycle is based on what? Explanation: This cycle is based on movement of CO2 is the ecosystem. It is found in gaseous form in air and dissolved form in water. Explanation: CO2 is stored in rocks and sediments in aquatic ecosystems. These are released into the atmosphere by weathering of the rocks. 4. How many different forms of precipitation are there? Explanation: The different forms of precipitation are rain (water drops with diameter at least 0.5mm), snow (ice crystals/flakes with an average density of 0.1g/cm3), drizzle (water drops less than 0.5mm), glaze (rain touches ground at 0oC), sleet (frozen raindrops) and hail (pellets or lumps of ice of >8mm size). Explanation: A nutrient cycle occurs within ecosystems and it is the movement of organic and inorganic matter between different members of the ecosystem. This is regulated by the food chains that use these for production and release them into the atmosphere on decomposition. 6. Living organisms can use Nitrogen (N2) as it occurs in the atmosphere. Explanation: The living organisms cannot use N2 to synthesise organic compounds. N2 is converted to NH3 by nitrogen fixing bacteria and then to nitrate by nitrifying bacteria which can then be used by organisms. Explanation: Nitrogen rich fertilizers are often overused. As a result, nitrogen gets into the soil, favouring growth of weeds. It is also washed into waterways, where again it causes a growth of aquatic weeds. 8. Which of the following cycle does not have a gaseous state? Explanation: Phosphorous is present as inorganic phosphate PO43-. It is released from rocks and sediments. It is absorbed by plants and is incorporated into the nucleic acids. Explanation: Water cycle has three components – evaporation, run-off and precipitation. Transpiration is included in evaporation. Run-off is that part of the water which is not evaporated. 10. How many steps are involved in the sulphur cycle? Explanation: The steps are assimilative sulphate reduction, desulphurization, oxidation of hydrogen sulphide, oxidation of elemental sulphur, dissimilative sulphur reduction and dissimilative sulphate reduction. 11. In the marine nitrogen cycle, _________ performs nitrogen fixation. Explanation: Diazotrophs are used to perform nitrogen fixation in normal nitrogen cycle. Nitrobactor is used for nitrification and Pseudomonas for denitrification. 12. In hydrogen cycle _________ is a sink used. Explanation: There are mainly 2 sinks used in hydrogen cycle – oxidation by hydroxyl radicals and microbial soil uptake. The rest of the options are sources. 13. Denitrification in nitrogen cycle happens in __________ conditions. Explanation: Denitrification refers to the process of reduction of nitrates back to nitrogen gas. Pseudomonas bacteria makes this happen. It uses nitrates in the soil to carry out respiration and consequently, produce nitrogen gas. 14. How many reservoirs are there in the oxygen cycle? Explanation: The three main reservoirs are the atmosphere (air), biosphere (the global sum of all ecosystems) and Earth’s crust. Explanation: Deamination is the process of removal of amino group from an organic molecule. The enzymes which catalyse this reaction are deaminases. 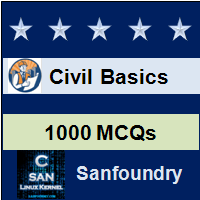 To practice all areas of Basic Civil Engineering for Freshers, here is complete set of 1000+ Multiple Choice Questions and Answers.